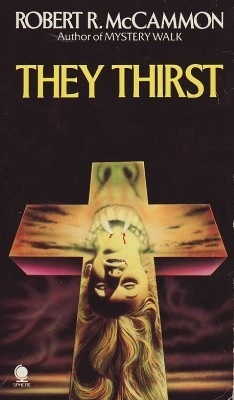 They Thirst was first published in 1981. First and foremost, it’s a story about vampires, but the book also contains many other horror novel ingredients including a serial killer, warnings from beyond the grave and a spooky, old castle. Half a world and half a lifetime away Andy Palatazin is the Detective Captain of Homicide at Parker Center in downtown L.A. He has never understood why his mother shot his father or why she seemed to spend the rest of her life looking over her shoulder. His mother has been dead for a while now, but she has begun to visit him from beyond the grave, sitting in her rocking chair and pointing, trying to tell—or warn—him about something. Andy doesn’t believe in ghosts any more than he believes in vampires, but he has been under pressure at work lately. The latest killer to stalk the L.A. streets has been nicknamed The Roach, because, after he has killed and raped his prostitute victims, he fills their mouths with cockroaches. Andy is working very hard on the Roach case and worries that the pressure may be getting to him. Palatazin is a great character, but he is only one of many great characters in the book. In fact, it is not often that I read a book that has such an abundance of interesting characters. Most of the characters don’t believe in vampires though, and that is what gives the blood suckers their advantage. The head vampire—The Master—is very old and is also the same evil force that orchestrated the fall of Krajeck. The Master is . . . interesting . . . to say the least. He likes to compare himself to Alexander the Great and taking the city of Los Angeles is only the start of this bad boy’s plans. Unlike Alexander though, the Master has more than an ever growing army at his disposal; he also possesses dark powers of his own, along with the help of a force older and darker than he is. Kobra is another interesting character. He is an albino biker, who the Master summons from Mexico using telepathy. Even at the beginning of the book, when Kobra still has blood running through his veins, it’s bad blood. The Roach is also an important character, as is the rather unorthodox priest, Father Ramone Silvera—a man with an immense physical presence, who can rough it with the best of them if he has too. Then there is the shining light of the comedy circuit, Wes Richer. He too is not without importance in the proceedings and it is, perhaps, his mystical girlfriend—the beautiful Solange—who is the first to realize that something evil is at work in L.A., when she receives some very worrying messages via her Ouija board. These are just a few of the characters who live and breath and sometimes die in the pages of They Thirst, but there are many more and they bring plenty of interesting subplots with them. They Thirst is 531 pages long and it is a dark and very well-written story. I have read it three times and it is one of the best vampire novels that I have ever had the pleasure of reading. It has a little of everything in it, from serial killers and spooky old castles to demonic forces, ghosts and magic. If you enjoy reading a good vampire story then I can definitely recommend They Thirst. I am not sure how easy it is to get hold of a copy of the book these days, but it is certainly worth keeping an eye out for it. UPDATE: Since this I originally wrote this review, things have changed and They Thirst has become available in eBook format and as an Audible audiobook a well.